Rutledge graduated from The University of Virginia with distinction in 1965 and The University of Virginia Law School in 1968. 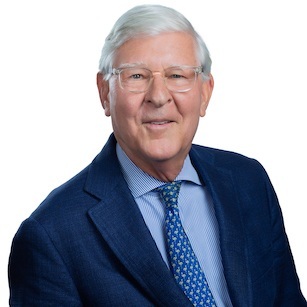 Before actively practicing law, Rutledge served in the U.S. Army and was awarded a bronze star for service as Captain of MACV Advisory Team No.7 from 1969 to 1970 in Long Khanh Province, Republic of Vietnam. Rutledge joined Young Clement Rivers, LLP in 1970 where he practiced with his father and ultimately became managing partner of a 50 lawyer Firm. At the beginning of 2011, Rutledge joined his son and Brian Duffy at Duffy & Young to continue his active and successful career of representing clients in the Courts of South Carolina. Rutledge holds the highest professional AV Preeminent rating in the Martindale-Hubbell Law Directory and has been listed for more than 30 years in the Best Lawyers in America and for more than 10 in years in Chambers USA America's Leading Business Lawyers. He is a South Carolina Superlawyer and also has been selected as a Best Lawyer in America for Bet-the-Company Litigation every year since 1999. Rutledge is active in the South Carolina Bar and served as its President in 1994-1995. He also served on the South Carolina Supreme Court's Board of Commissioners on Grievances and Discipline. Rutledge is a Diplomat of the American Board of Trial Advocates (since 1988) and a Fellow in the American College of Trial Lawyers (since 1991). In addition to his work as a lawyer, Rutledge has served on Charleston’s City Council and the Boards of BB&T, Woodberry Forest School, Historic Charleston Foundation, South Carolina Coastal Conservation League, and Lowcountry Land Trust. He also was President of a railroad, and Co-Director of Business Development for American Windsurfer Magazine. Rutledge currently serves on the Board of the Charleston Library Society and Brick House Plantation. In his time away from serving clients, Rutledge is a fisherman, sailor, traveler and an avid reader.